Mixed Media is the Message. This new series could easily have been called “My Favourite Things” or “De-stilled Life Pictures”. Elements of interest from previous work are separated, re-assembled and held in tension in layers across the surface of the canvas. Flowers, an interesting old metal bowl, discs of colour from a watercolour palette, lily pad outlines, various collaged items and allusions are assembled to complete the composition. 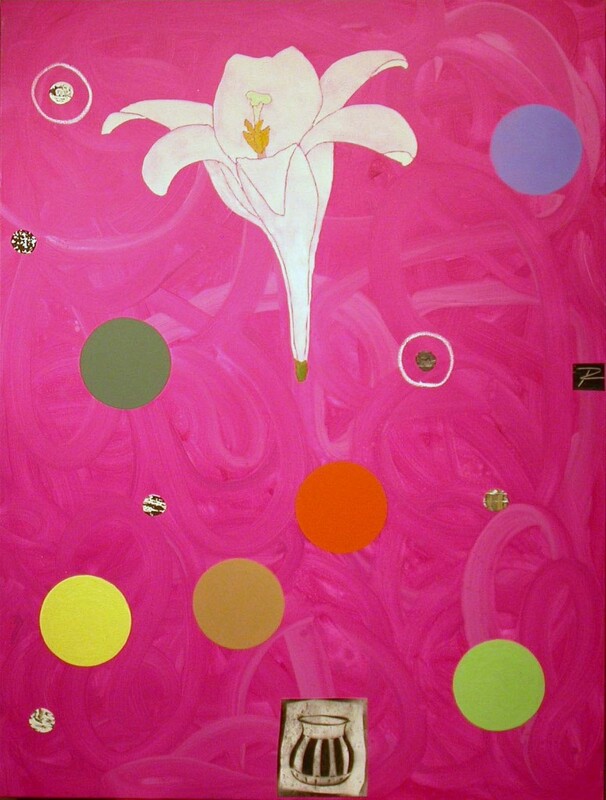 Interestingly, to me, the result is alive in the “Now” 64″ x 48″, 2010. This vibrant hot pink painting is one of my favourite paintings in this series.